Should TCS now be afraid of Cognizant? Bangalore: Cognizant Technology Solutions Corp. is within striking distance of overtaking Tata Consultancy Services Ltd (TCS), India’s largest software services company, in terms of revenue earned from North America—the world’s biggest market for information technology (IT). In the three months ended September, Cognizant earned North America revenue of $1.504 billion (around ₹ 8,167 crore today), only $1.6 million shy of the $1.506 billion TCS earned from the region in the same period. On Wednesday, Cognizant reported a 21.9% year-on-year increase in net profit to $276.9 million for the three months, the third quarter of fiscal 2012 for the US-based company that has most of its employees in India. Cognizant follows a January-December accounting period. Overall revenue grew 18.2% to $1.89 billion. Revenue rose 5.4% from the preceding three months. And the company’s forecast for the December quarter implies an increase of 2.5%. To be sure, Cognizant is overdependent on US customers, who make up 79.5% of its business. TCS, which counts Citigroup Inc. and General Electric Co. among its top US clients, earns around 53% of its revenue from the region. Already, Cognizant has overtaken Wipro and Infosys in quarterly revenue, causing anxiety among top executives at the Bangalore-based companies. For the first time, Cognizant overtook Infosys in total quarterly revenue in the three months ended June and earned more business from the US than the company in January-March last year. “They (Cognizant) are growing fast and furious, we should give it to them to be growing like this so consistently," said a senior executive at one of these firms, requesting anonymity because he did not want to acknowledge this publicly. Slowly but steadily, Cognizant is now closing the gap with TCS in some market segments. TCS’s revenue is currently 52% higher than Cognizant’s in the first nine months of this calendar year. During the January-December period of 2008, Infosys’s revenue was 66% higher than Cognizant’s, and it took a little over three years to bridge the gap. “Cognizant’s robust growth in a challenging environment highlights that differentiation amongst vendors and market-share gains are becoming increasingly common," said analyst Sandeep Muthangi at India Infoline Ltd. “Going forward, we believe that the gap in growth rates amongst larger Indian vendors will narrow." Cognizant, which counts drug maker Merck and Co. and JPMorgan Chase and Co. among its top customers in the US, increased its revenue from the region by 20.3% during the September quarter. The firm said revenue for the year ending 2012 will grow at least 20% to $7.34 billion. Revenue for the fourth quarter ending December is expected to be at least $1.94 billion, it said. “Our consulting-led approach, intimate client relationships, deep domain knowledge and robust execution give us the confidence to deliver revenue growth of at least 20% in 2012," said chief executive officer Francisco D’Souza. Cognizant does this, analysts say, by spending more on sales and marketing. While top Indian technology firms spend up to 14% of their revenue on sales and marketing, Cognizant spends 21%. This is helping Cognizant win fresh business from some existing Infosys customers, including Koninklijke Philips Electronics NV. “We believe the gap in top-line growth between CTSH (Cognizant) and other Indian IT services vendors will likely continue to widen in the future," Jefferies analysts said in a 2 November report. “Over the last few years, CTSH has delivered industry-leading top-line growth and market share gains, and we believe the company now holds the undisputed leadership position in the Indian IT services space, due to a decade-long strategy of re-investing excess margins into the business." While rivals such as Infosys focus on projects that fetch them at least 29% profit margin, Cognizant has been following a different strategy, experts say. “The high-margin business equals to profitability for vendors like Infosys. Cognizant focuses on high value for customers," said Ray Wang, founder of enterprise research firm Constellation Research Inc.
Clearly, Infosys’s focus on high profitability is not helping it compete effectively with Cognizant. In four of the past six quarters, Infosys has missed the lower end of its own forecast. In a year when industry lobby Nasscom has projected 11-14% annual growth in software exports from India, Infosys has forecast revenue growth of 5%. Analysts such as James E. Friedman at Susquehanna Financial Group Llp had expected Cognizant to report around 4% growth in revenue for the September quarter on a sequential basis. Brokerage Jefferies had predicted that the company would report third quarter revenue growth of 5.5%. 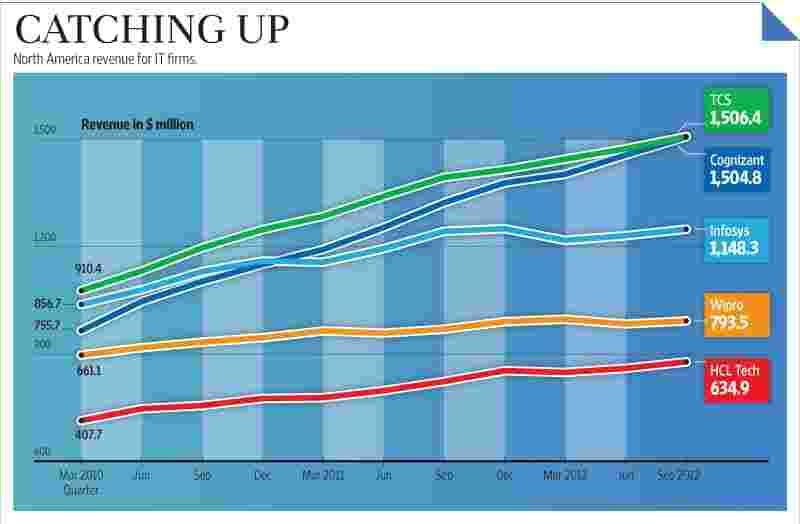 Earnings at India’s top IT firms have been mixed. In October, TCS reported a profit jump of 49.2% and revenue increase of more than 34% in the quarter to 30 September from a year earlier. Infosys continued to disappoint investors by not raising its revenue forecast for the year despite making an acquisition and reaping the benefits of a depreciating rupee. Last week, Wipro said it hoped to catch up with rivals after several quarters of underperformance.